Malaysia is protecting its sovereignty and dignity by expelling the North Korean ambassador, the prime minister said Monday. KUALA LUMPUR: Malaysia is protecting its "sovereignty and dignity" by expelling the North Korean ambassador, the prime minister said Monday, as relations between the countries frayed over the poisoning of Kim Jong Nam, the estranged half brother of North Korea's leader. In an attack many believe was orchestrated by Pyongyang, Kim died less than 20 minutes after two women wiped VX nerve agent on his face at Kuala Lumpur airport on Feb. 13, authorities say. The women, one from Vietnam and one from Indonesia, have been charged with murder. North Korea has denied any role in the killing and accused Malaysia of conspiring with its enemies. North Korean Ambassador Kang Chol has rejected a Malaysian autopsy that found Kim was killed with VX nerve agent, a banned chemical weapon. "It means that we are firm in defending our sovereignty and dignity," Najib said. "Don't ever insult our country and don't try to cause disruptions here." 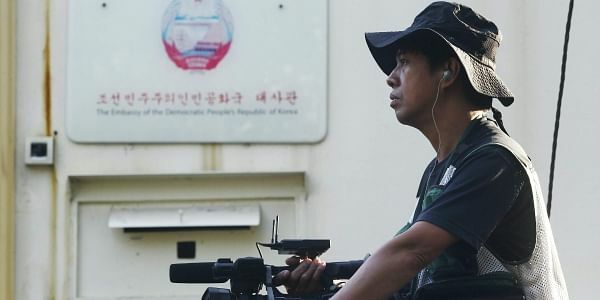 Kang faced a Monday deadline to leave the country after authorities here declared him "persona non grata" on Saturday. Malaysia's finding that VX killed Kim boosted speculation that North Korea was somehow behind the attack. Experts say the oily poison was almost certainly produced in a sophisticated state weapons laboratory, and North Korea is widely believed to possess large quantities of chemical weapons, including VX. "We are saying, based on autopsy findings, there was no heart attack," he told reporters at Parliament. Still, a lawyer for the Vietnamese suspect said news of existing health problems should be cause for a new autopsy. "When doctors performed the first autopsy, they had no information of (his) illness. This is very important because new information could be found," attorney Selvam Shanmugam, who represents Doan Thi Huong, told Vietnam's state-run online newspaper Zing. The two women accused to poisoning Kim say they were duped into thinking they were taking part in a harmless prank. Malaysia is looking for seven North Korean suspects, four of whom are believed to have left the country on the day of the killing. The three others, including an official at the North Korean Embassy and an employee of Air Koryo, North Korea's national carrier, are believed to still be in Malaysia.